A mixture of skin from shaved truffles and from truffles sliced into small strips. The perfect match for your mashed potatoes, omelets, risotto or pasta. Storage: Store in a cupboard. Once open store in fridge and consume within 2 days. Nutritional Info: Per 100g : 246 kJ (59 kcal) Fat : 0.9g of which saturated : 0.2g / Carbohydrates : 3g of which sugars : 0.2g / Protein : 5.5g / Salt : 0.9g. Dietary Information: Suitable for vegetarians. Gluten free. Wheat and derivative free. Egg free. Nut free. Lactose free. 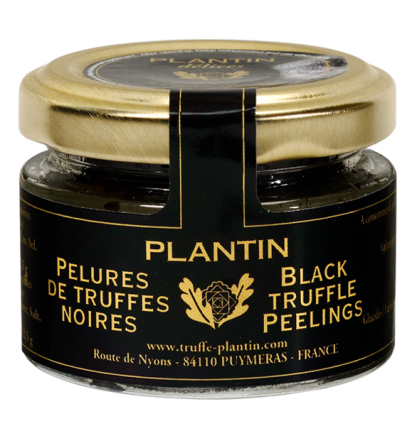 As ever with truffles, it’s best to add them to your dish just prior to serving and do not apply too much heat as this destroys their delicate flavour.